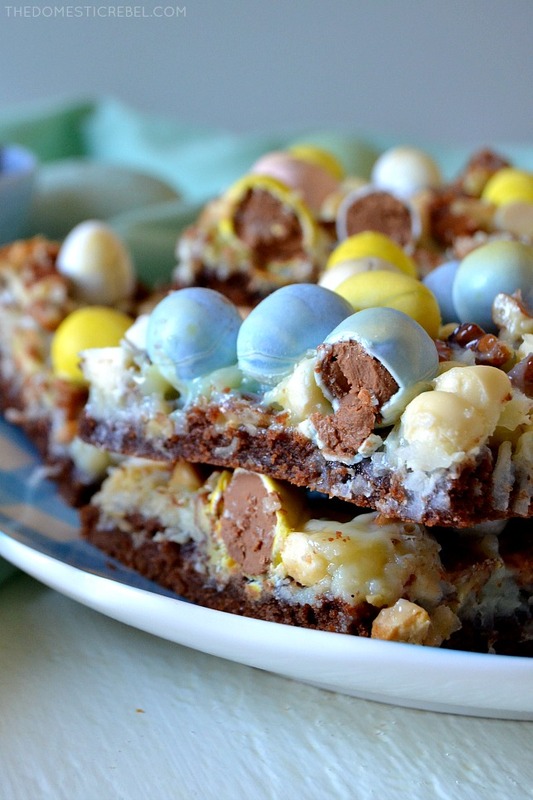 I just love these easy Cadbury Egg Magic Bars! 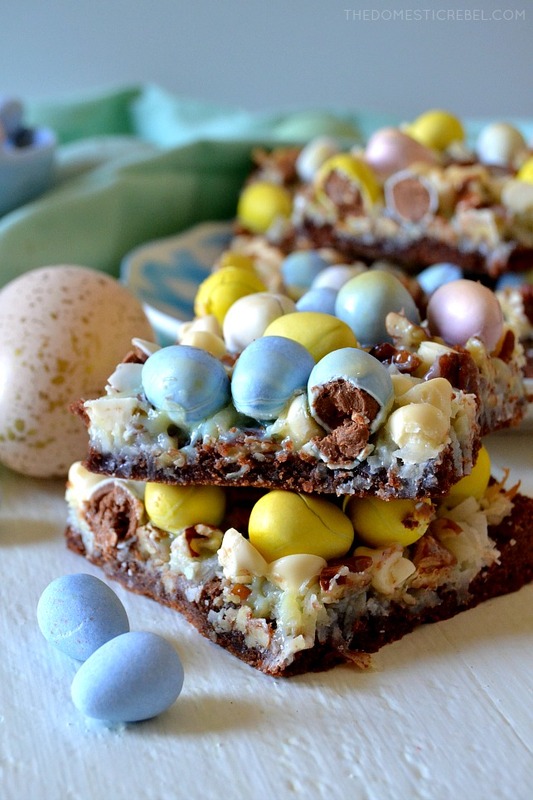 Complete with a fudge brownie base, coconut, white chocolate chips, pecans and addictive Cadbury eggs in every bite make these bars so delicious! 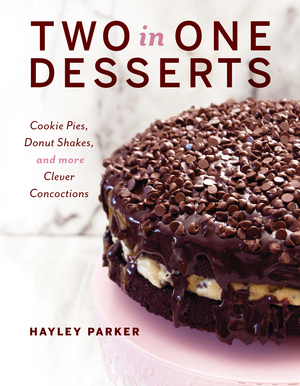 I am all about easy desserts, as you know. Sometimes when people find out what I do for a living, they ask if I make cakes for events. And I have to reply with a resounding NO. Granted, I think people are a little confused with the whole “food blogger” thing. Where do the treats go? Do I sell them? Do I do custom orders? Will I make their best friend’s baby’s smash cake? I’m always happy to answer questions since my job is very unconventional, but I absolutely, positively do not take custom orders, nor do I sell my stuff. To answer that question: I give it all away. Neighbors, the front office workers at my apartment complex, friends, family, and everyone else gets the treats as I usually rotate where I drop them off. Still, some people have difficulty grasping the fact that I’m not making custom things for people to buy. I did it for a little bit when I was first starting out but realized I loathed the pressure and anxiety I put upon myself to make everything look “perfect.” Plus, I catered a wedding once and that couple is now divorced, so clearly my track record is not good and I am probably a bad omen. ANYWAY, the point of all of this (my blog, the fact that I don’t sell my treats, etc) is because my blog is to teach people how EASY it is to bake. You don’t have to be a professional to whip up some amazing desserts. 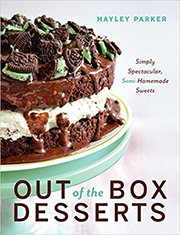 A lot of my recipes start with boxed mixes that, when transformed with other every day ingredients, turn out extraordinary and you wouldn’t even know they started from a box of cake mix! I love that, and I love when people realize how simple it is to create unique treats in the kitchen. This is a prime example of something you can make in your own kitchen that’s unique, easy, fast, and impressive… in fact, unless you don’t like chocolate, I cannot imagine anyone turning these Cadbury Egg Magic Bars down! I have many different magic bar recipes on my blog and they all start with a box cake mix as the base. However, instead of adding the ingredient amounts on the back of the package to make a fluffy cake, we’ll reduce some of the ingredients and omit one of them so the cake is more like a fudge brownie bottom – not cakey at all. While traditionally magic bars have a graham cracker crust, I’ve found in my years of research (ha!) that graham cracker crusts just aren’t substantial enough to hold the weight of all the toppings I like to add to my magic bars like chocolate chips, nuts, and candies. Plus, once you add the sweetened condensed milk to the bars, had we used graham crackers, it would have seeped down into them, making them softer and less stable. That’s why I recommend using the cake mix for a substantial, stable fudge brownie base! 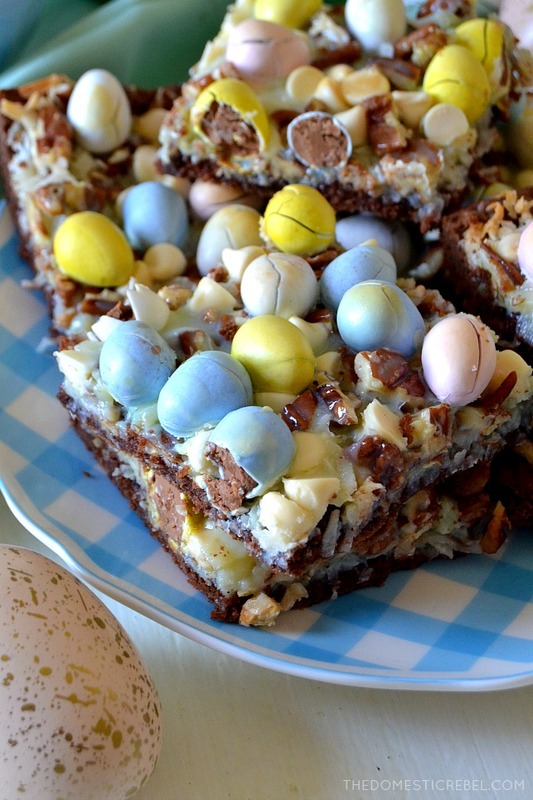 The toppings I chose for these magic bars in particular are chopped pecans, white chocolate chips, coconut, and Cadbury mini eggs – not the creme eggs, but the solid milk chocolate ones with the crispy candy coating. If you don’t like coconut, simply leave it out. If you’d prefer walnuts to pecans, make the substitute. Like dark chocolate Cadbury mini eggs? Use those instead! 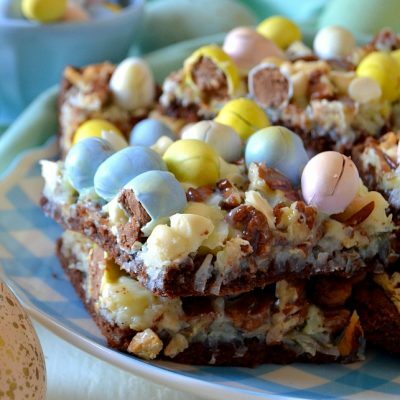 The toppings are merely a guideline and a source of inspiration for your own magic bar creation – I just happened to love the nutty pecans, sweet white chocolate chips, light coconut and of course, the star: the Cadbury mini eggs! Once all the toppings are on the base, you’ll drizzle on a can of sweetened condensed milk. This binds everything together and adds sweetness (duh) – it’s basically nectar from the gods. Bake it up and let it set for at least an hour or two before cutting it into squares. That’s the hardest part of this recipe by far! 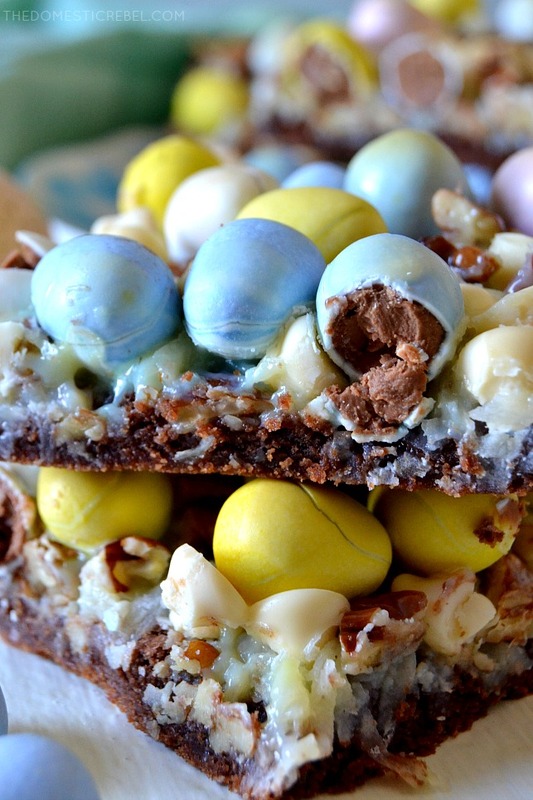 Now who doesn’t want this as their Easter dessert?! I know I can’t wait to make it again! 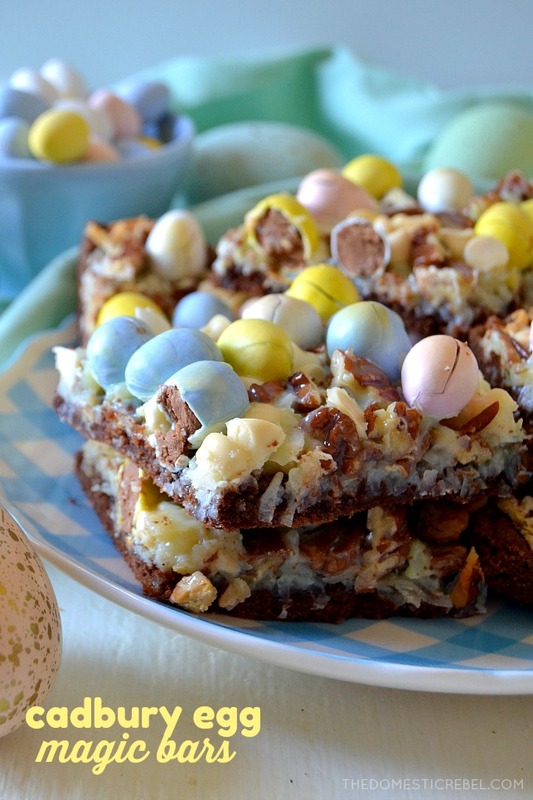 These Cadbury Egg Magic Bars are super easy, fast and totally delicious! 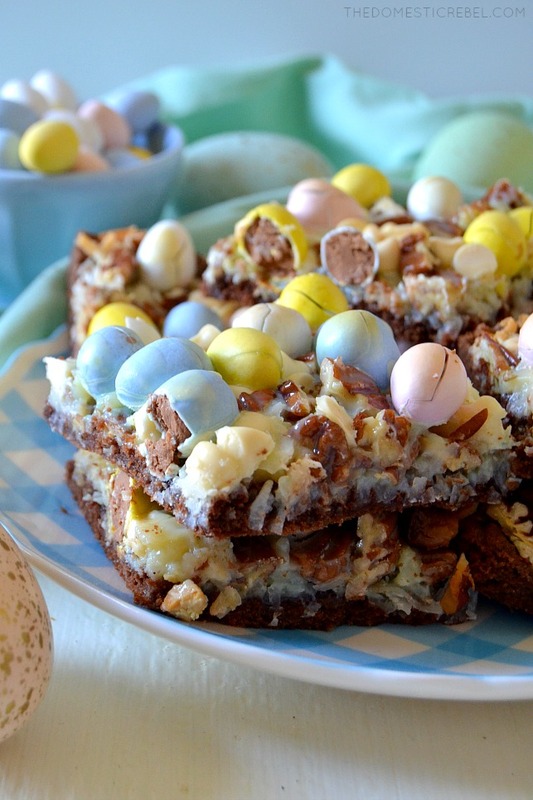 Chock-full of coconut, pecans, white chocolate chips and Cadbury mini chocolate eggs, they're crunchy, chewy, gooey and perfect! Preheat oven to 350 degrees F. Line a 9x13" rectangular baking pan with foil, extending the edges of the foil over the sides of the pan. Spray the foil liberally with cooking spray. Set aside. In a large bowl, combine the cake mix, butter (or oil), and egg and mix well until a soft dough forms. Press the dough into the prepared baking pan in an even layer. Bake for 12 minutes. Remove from oven, but keep oven on. 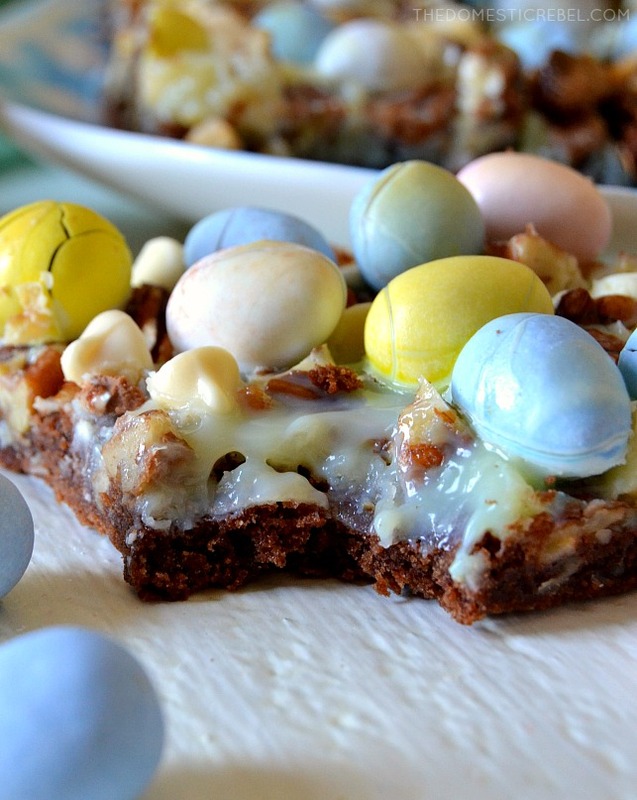 Top the partially-baked crust with the coconut, chopped pecans, white chocolate chips and Cadbury mini eggs. Drizzle the top with the sweetened condensed milk. Return to the oven and bake for 18-20 minutes or until the top is lightly golden brown and the center appears set. If it jiggles slightly, that is okay - but it should not be sloshing around in the pan. Cool completely, then let set for 1-2 hours before cutting into squares. I love that these have all the textures: crunchy, chewy and gooey! So perfect!